Video production is a fast-paced industry, and having clear guidelines at every stage is essential not only for coherent delivery but also for efficient time and resource management. Time and market pressure can put a severe strain on filmmakers, and having detailed, quality storyboarding support can help reducing shooting time, post-processing and can even improve output quality. Despite the essential nature of storyboarding, it isn’t a core activity for filmmakers. Back Office Pro unburdens the stress of production houses, film studios, directors, and filmmakers by offering extensive storyboarding support. As a trusted, long-term partner for many in the industry, BOP offers top quality storyboarding services, delivering on time and at a competitive cost. With a team of skilled visual artists and experienced analysts, project managers, and support personnel, Back Office Pro takes on any storyboarding challenge, from quick-turnaround advertisements to large-scale film production. Seasoned artists and script analysts with proven experience in planning shots, and drawing panels to accurately illustrate the narrative, demonstrate action, and maintain continuity between scenes. Specializing in sequential art, BOP’s storyboarding team can create simple or detailed storyboards, at different sequence rates with a focus on anatomy, perspective, and composition, camera angles, and lighting. Capable of composing wire frame drawings from which the more detailed illustrations will be developed using a progressive approach. Capable of delivering remarkable output with limited input, offering accurate storyboarding based on the script only. Able to accommodate closer collaboration with the writer, or producer if required, with their extensive experience which allows them to understand the subtleties of storyboarding. Capable of creating complex storyboards including dialogue indicators, character performance, and camera moves, the team will describe character blocking within scene locations via descriptive set diagrams and camera plans. The team is also able to produce high-quality animatic from approved storyboards as further support to production planning, assisting the production team to identify scripting inconsistencies and estimate time and expenses. 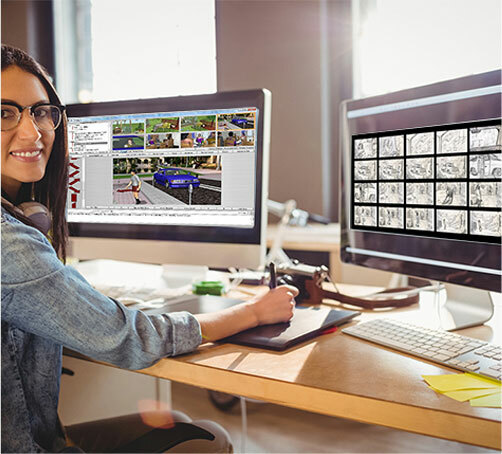 Expertise in multiple storyboard software packages such as Storyboard Lite, Frame Forge 3D Studio, and Storyboard Artists & Storyboard Quick. All the members are also proficient with Adobe Photoshop, After Effects and Premiere, as well as 3D design and modeling software. Thumbnail storyboardThe first sketches of a storyboard, the thumbnails are the quickest way to assess the overall cohesion of a script and are often accurate enough to help identify problems and production pain points. Floating storyboardThe next stage in storyboard development, the floating storyboard follows the thumbnails, offering a more comprehensive and possibly more sequenced look at the script, the floating storyboard helps to identify a further layer of production challenges. Framed storyboardFramed storyboards include drawings in a fixed aspect ratio. By this time, final production ideas have settled, and the storyboards can help relating to the script. Photo storyboardThe final layer of storyboard drafting, the photo storyboard allows the production team to check all the details of the storyboards against frames, characters, and sets. Animated storyboardThe most accurate and effective way of determining scripting problems, we create animatic support based on detailed storyboards, which have been approved by the client. Film storyboardLarge-scale, skill-intensive projects, film storyboards entail more complex scenes and more actors than an advertisement or short video storyboarding, allowing the BOP team to display their full creative skills. Efficient use of resources - requiring minimal input and instruction, outsourcing to Back Office Pro allows clients to free up valuable time, while an open and transparent process allows them to freely supervise each project. Acting as the missing link between scripting and filming, we help the production units to stay between production deadlines without compromising on clarity, with a scalable workforce to meet any project needs. Skilled storyboard artists can work as dedicated resources, Full-Time Equivalents, or on hourly contracts - on-demand and based on workload and turnover time, catering to even the strictest time requirements. Committed to developing long-term working relationships, we are certain that our offering provides the perfect blend of cost-efficiency, quality output and timely delivery for every project we undertake, the combination of which has led to trustful partnerships with production houses around the world. If you like to avail Back Office Pro’s extensive storyboarding services, complete the contact form on our website and you will receive a response from our Business development Manager within one business day.